Want to manage Digital Marketing Campaigns for one of the most trusted Mobile Performance Networks in the world? 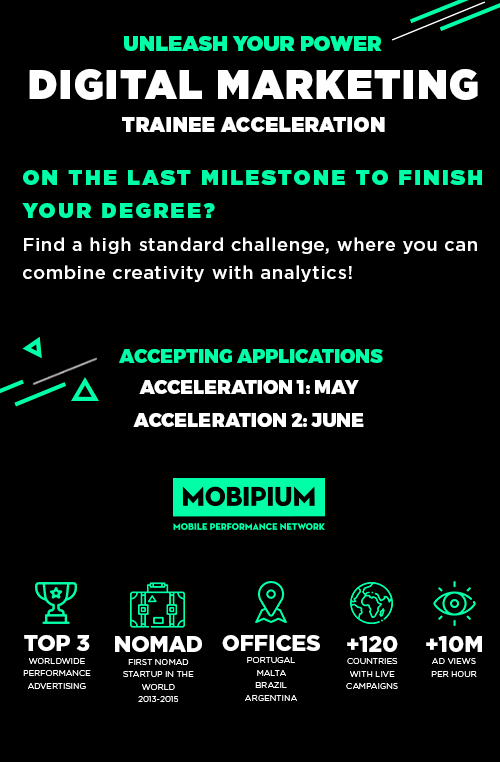 Founded in 2013 and based in Lisbon, Mobipium is one of the Top3 Mobile Performance Networks, connecting the right users with advertisers’ products and services. Both our creators and our entire team are passionate about Mobile Marketing. We are tech lovers, who are constantly looking for new, cutting-edge marketing approaches. We promote a culture of creativity, responsibility and ambition through our services, brand, and, most importantly, our people. As Marketing Manager @Mobipium, your mission will be understanding people and building the right audiences to promote our clients’ products and service. Your main responsibility will be creating and developing successful Performance Marketing campaigns through several acquisition channels. As a Performance Marketing company, @Mobipium we are utterly focused on results and have an optimization mindset in everything we do. We’re looking for intelligent, versatile people, who combine creativity with analytical skills. People who are really passionate about online marketing with ambition to grow to their full potential. Run A/B testing campaigns in order to improve ROI optimization. Self-taught and genuinely passionate about Marketing, proactively looks for new insights to grow as a professional. Sugar-free & no plastic concerns.